For Part 1/3, click here. When I read this email, I went through a few different emotions. First - anger. How dare this institution try to shut me down? Here I am, having left behind my whole family and comfortable life in Canada to live as an immigrant in Israel where I faced a huge down-grade in salary, semi-frequent bouts of violent conflict and substandard living accommodations. I pay taxes, volunteer for causes and contribute to society. I had to get my license all over again, learn a new language, make new friends and make new connections. And now, after everything I have worked for and all the money I have invested, I have to close?! But then I moved to pride … Word had gotten out about my small start-up and someone actually felt threatened enough to pay a lawyer’s fee to send me that letter. There had probably been a meeting about me. I laughed and felt important. I called-up a cousin who happens to be an IP lawyer in New York. He told me that, while I was probably not technically violating any law, it would be better not to fight this giant as it would probably drain my resources. “Businesses rebrand all the time,” he said. So now I was faced with a decision. Do I take this as a sign of defeat, close-up shop and move on with m life? Or do I use this challenge as an opportunity to infuse a new light and energy into the business? While pregnant. I talked it over with my husband and we decided: it’s now or never, let’s go with option b.
I rounded-up a group of friends and facilitated a “rebranding focus group pizza party” in my salon. That night, about 10 girls (most of them Anglo’s who choose to live their lives in Israel) piled into my Jaffa apartment. I gave them a bit of background, talked about the company’s core values, mission and business model. I led some brainstorming activities, a free writing exercise, word association and role playing game. It was a lot of fun. The evening was super informative and made me feel really optimistic, excited and eager to get moving. Well, the first part was easy enough. I enlisted the help of a fellow Torontonian living in Jaffa to guide the rebranding process. 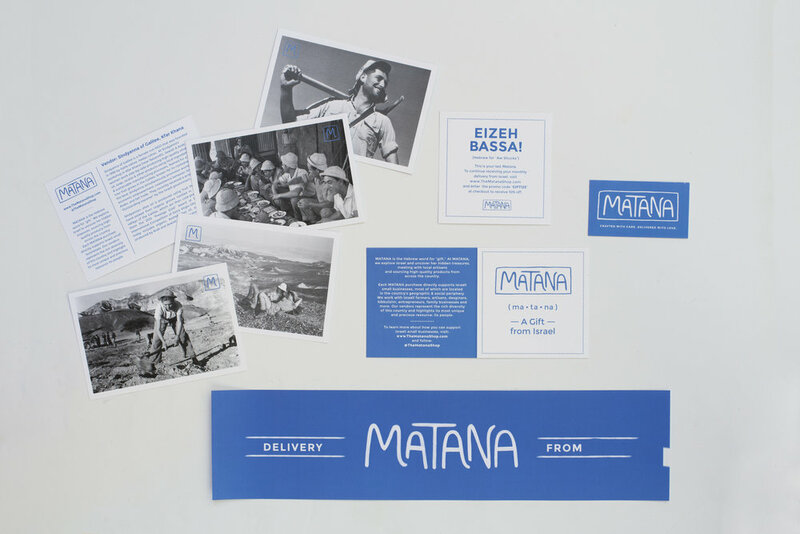 We decided on MATANA (Hebrew for “gift) - representing the “gifts” of the land and a two-way exchange between Israel and the Diaspora. We worked with a designer to create a new logo, shot a new promotional video (the one I had spent my savings to create for Blue Box a few months before was no longer relevant), redesigned our packaging, and re-did our website… We relaunched, and set-out to reach new sales goals.